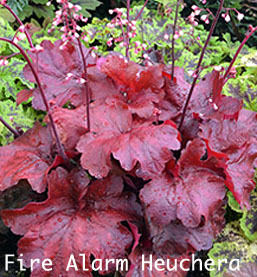 The Heuchera Fire Alarm has thick leather like red leaves that creates a mounding plant shape. These deep red Coral Bell leaves hold their color from spring through fall. The Fire Alarm Coral Bells is the reddest of any of the Coral Bells, being brightest with cooler temperatures. The Heuchera Fire Alarm Coral Bells explodes with pink to white blooms during the summer months of June, July and August. Great fall foliage. Plant in shaded areas for color impact.